See my sides with your eyes. We talked about pizza, pie, birthday hats, and noses. 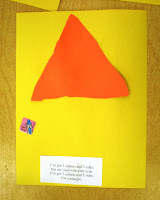 We didn't get to look around the room for triangles as our time was short. We had a modified school schedule because of frozen roads in the morning, this cut our day short a bit. So, we went to the tables and it was time to cut. ABSOLUTELY AMAZING! 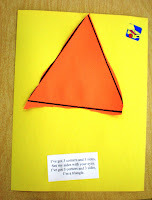 If you read my blog you will remember that I said the children were having some trouble following the lines. Well, it seems overnight most of them have mastered that skill. The shapes actually looked like triangles when they were finished. I had a couple of children that kept saying they couldn't do it, but we helped them through and they were so proud of themselves. I had one little boy that came to the tables and was SOOO excited. He said, "Oh Yeah! 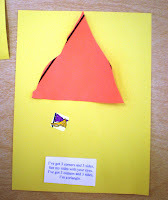 Shape cutting, I love cutting out shapes." I thought it was very cute. I love seeing little ones get excited about learning. My kids have been having fun with Tangrams this week. So of course they gave me a topic to write about yesterday. Nice site.This site ia a child friendly site,and it will help lots of people.I like child-friendly sites.Keep it up!